On October 23rd last year New Zealand First leader Winston Peters announced that he’d chosen the most radical left wing coalition in this country’s history to become our new Government. While those involved in previous MMP negotiations had rejected the idea of allowing the extremist Green Party anywhere near ministerial power, Winston Peters accepted they would have three Cabinet posts. He said he was foreshadowing the downturn so he wouldn’t get blamed for it when it arrived. But whether he likes it or not, he is to blame – for choosing parties that advocated deeply radical left-wing and spendthrift policies to run the country, instead of the party that most people voted for, with its proven track record of responsible governance. After only 6 months, the new Government’s policy agenda is now being identified as causing the economy to slow. They forecast New Zealand’s economic growth slowing to 2.4 percent per annum by the end of this year and slipping below 2 percent during 2019. They also predict that our per capita GDP growth could fall into negative territory. They say, “A range of factors have combined to drive the slowdown, many of which can be sheeted back to government policy”. Included in the factors they identify are “the dumping of major roading projects in favour of rail and public transport”, “capacity constraints in the construction sector”, and a major “slowdown in migration” – from 68,900 in the year to March to below 17,000 by early 2021, resulting in more Kiwis heading across the Tasman, and “fewer New Zealanders coming home”. Government policies of major concern to the business sector include changes to employment law and New Zealand First’s minimum wage increase to $20 an hour. Firms are worried that increases in the minimum wage are forcing up costs and constraining their ability to grow, since wage relativity in the workforce is requiring pay increases for other workers as well. As a result, many businesses say they are now investigating labour-saving technology to reduce their reliance on workers. Is this what New Zealand First really wanted when they promoted their irresponsible $20 an hour minimum wage policy? And don’t they understand what a disastrous impact it’s having on the most vulnerable and unskilled in society, who are finding it increasingly difficult to get a job? Last week’s shock announcement by the Prime Minister that she is banning all future deep sea oil and gas exploration in New Zealand – without any consultation at all with the oil and gas industry – will no doubt undermine business confidence even further. It appears the Prime Minister’s motivation for announcing this Green Party policy as her own – on the eve of her overseas trip – was personal. She wants to make an impact at the Commonwealth Heads of Government Meeting in London, where, just like at APEC last year, there will be opportunities for her to demonstrate that global warming is her nuclear free moment, and that through her radical climate change action, she’s leading the world. As the Mayor of New Plymouth described it, the Prime Minister’s decision is a “kick in the guts for the future of the Taranaki economy”. She’s put at risk the livelihoods of 11,000 people who work in the oil and gas industry – along with almost 120,000, who live in the Taranaki region. At the present time, some 60 percent of New Zealand’s energy needs come from oil and gas. The oil and gas industry contributes over $2.5 billion to our economy and pays around 42 percent of all profits to the Government in the form of royalties and income tax – some $500 million annually. At the current production rates, New Zealand’s natural gas reserves in the main Pohokura, Maui, and Kupe fields in Taranaki, will only last about 10 years. This has led to concerns that the ban on new offshore exploration will hit gas-dependent households and businesses hard. Around 265,000 homes rely on gas for cooking and heating, as do schools and hospitals along with other public and community amenities. Gas is used in the production of most of our exports – almost half of the energy needs of food processing, and a third of wood processing. It also plays an essential role in the production of methanol and urea fertiliser, and is crucial to the electricity system, providing backup generation when demand exceeds supply, or when the hydro lakes are low. When it comes to oil, New Zealand produces just over a third of our needs. Oil is one of our top ten export earners, with almost all of the crude oil we produce of such a high quality, that it’s exported. To meet domestic demand for fuel, lower quality Arabian crude oil is imported and refined at Marsden Point. Altogether, New Zealand has 17 sedimentary basins within our Exclusive Economic Zone that contain possible commercial quantities of oil and gas. Currently only one basin – the Taranaki Basin – is in operation with 20 oil fields. It was always New Zealand’s ambition to become energy self-sufficient through exploration. Our untapped oil and gas reserves are said to be of a ‘world-scale’, and – like in Norway – they have the potential to transform our economic future. Since Norway developed its oil and gas resources in the 1970s, it has experienced economic surpluses. The Oil Fund – now the Government’s Pension Fund – was established in 1990 to invest the surplus revenues of the Norwegian petroleum sector. It now has over US$1 trillion in assets, making it the largest sovereign wealth fund in the world. That could have been New Zealand’s destiny. But thanks to this radical three party government, in the long run, we may have to rely on costly imported energy, not only for the future security of supply of our electricity system, but even to fire up our barbeques. While the Minister of Energy has explained that the 31 active exploration permits, with mining rights that could last up to 40 years, won’t be affected by this ban, the problem is that the investment needed to produce commercial levels of oil and gas from wells, runs into billions of dollars and Labour’s announcement has sent out a clear signal to oil and gas investors that ‘your money is not welcome in New Zealand’. A case in point is New Zealand Oil and Gas, which has a joint permit with Beach Energy to explore the Canterbury Basin off Oamaru. It’s an area of huge potential, but since it will cost over $50 million to drill an exploration well – with only a 20 percent chance of success – the companies would need investment partners prepared to take the risk. Then, if they do want to develop a field, a massive $6 billion dollars in infrastructure spending would be required. Since long-term capital commitments are far less likely in a hostile political environment, the most probable outcome of Jacinda Ardern’s announcement is that oil exploration companies will take their activities to countries that are more welcoming. 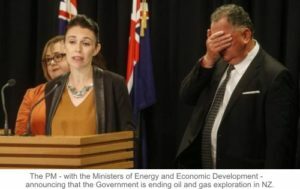 As long as there remains a demand for oil products, oil exploration will continue – it just won’t be in New Zealand. New Zealand First has given us a very extreme Government, with a very naïve Prime Minister. Any thought that Winston Peters will be a moderating influence on this Government is just wishful thinking. In fact this is the third time in just two weeks that New Zealand First, as the self-proclaimed Champion of the Provinces, has rolled over. Firstly, they supported Labour’s announcement that large-scale irrigation schemes would no longer receive government funding – even though they know that such schemes are the lifeblood of rural communities. Secondly, they supported the ‘no-new-taxes-until-after-the-next-election’ Prime Minister’s announcement that all motorists will have to pay a new petrol tax of 12 cents a litre, with Aucklanders forced to pay over 20 cents. And now, they have agreed to the wind-down of the oil and gas sector – even though it has the potential to bring real jobs and growth to the regions. This will no doubt bring about the further deterioration in our economic prospects that Winston Peters predicted. Is this really what New Zealand First voters wanted? Do you think New Zealand First should have used their veto power to block the ban on oil and gas exploration? Of course they should, but aren’t you forgetting that NATIONAL were the idiots who signed the Paris Climate Accord. As for Marama Davidson; another brown person to make up the 50per-cent ‘indigenous governance promised with the U.N. agreement signed by ‘Sharples’ & ‘Key’…. A.G.R.